We received our two copies of the monthly magazine that explains how to live more simply. 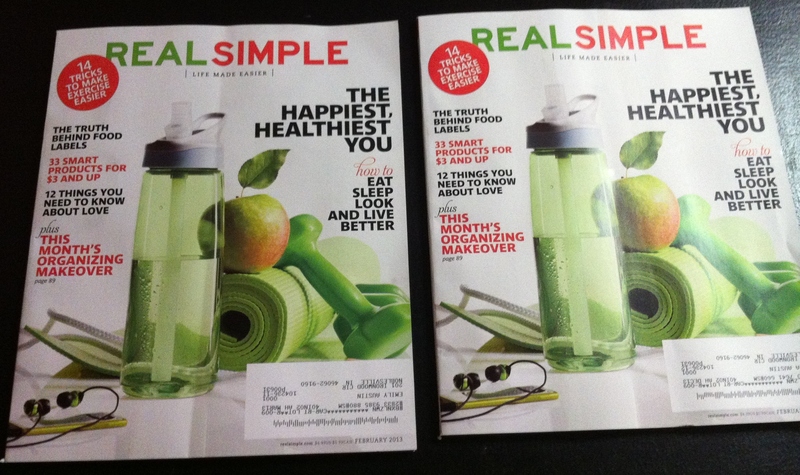 In an effort to live lives in a more simple fashion, we get a magazine called “Real Simple”. If you’ve ever flipped through the pages of this 3/4 inch thick periodical, you know that it about everything BUT simple living. For example, the February edition (pictured here) provides a helpful segment entitled, TRENDS Worth Trying. In this three-page layout, the editors provide 23 items that everyone must have to simplify their lives. Specifically, my feet can be grateful in floral-patterned heels for only $435. A set of Gold and leather bangles to wear on my wrist will only set me back $330. Leather and suede boots that “looks refined, not racy” will only require $580 from my simple pockets. All toll, this segment features everything from hydrating hair oils, to leather fashion accessories, to blouses, pillows, make up, and plates. In an effort to simplify my life and be stylish at the same time, I calculate that I will need to invest a mere $3091. And that’s just this month’s article. I’m sure there are more trends I will need to follow in March! Thankfully, through a small mix up, we receive two of these magazines each month. They arrive on the same day. I’m sure our mail-woman is very impressed.